Maxillary artery is the artery that supplies the facial region. It is one of the terminal branch of external carotid artery. This artery as it arises from external carotid artery from behind the neck of mandible. It then between mandible ramus and sphenomendibular ligament via the parotid gland. Here it gives 15 different branches from three different portions. Finally it runs to the pterygopalatine fossa. It is called First Portion or Mandibular portion. It is also called Second Portion or pterygoid portion. The Third portion is called Pterygomaxillary portion. Artery of the pterygoid canal. 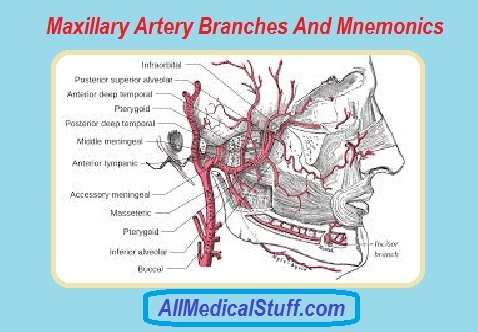 If you have difficulty learning the names of branches of maxillary artery then you should take benefit of mnemonics. Because if you learn the names of maxillary artery with mnemonics, you would never forget the names. Therefore first of all learn the mnemonics given below and then learn the names according to it. D stands for deep auricular artery. I stands for inferior alveolar artery. A in america stands for accessory maningeal artery. M in america stands for Masseteric artery. P stands for pterygoid artery. D stands for deep temporal artery. B stands for buccal artery. S stands for sphenopalatine artery. D stands for descending palatine artery. I stands for infraorbital artery. P stands for posterior superior alveolar artery. M stands for middle superior alveolar artery. P stands for pharyngeal artery. A stands for anterior superior alveolar artery.